This is happening in the kitchen… well, technically in the freezer, right now. I promise I will be back with regular posts tomorrow. PS. I originally titled this post Monday Night. It’s going to be a long week. It’s Foodie Penpal Reveal Day! This month, I sent a package to Marcia from Florida. She’s a fellow runner and I loved getting to know her and reading her blog. You can check out her blog by clicking here. I was lucky enough to be paired with Kelsey. She sent me a pretty amazing package full of goodies from California. Kelsey-Huge thanks, this was awesome! A homemade baggie of cocoa haystacks! An organic dark chocolate bar. A nice little card (above) and recipe for peach salsa-yum! I was so excited about the recipe, I decided to share it with all of you! Bananas and Chocolate? Yes, please! I can’t decide what my favorite thing was… but these crackers are definitely up there. The haystacks didn’t hold up too well in the mail…but I still munched on them. Tasty. 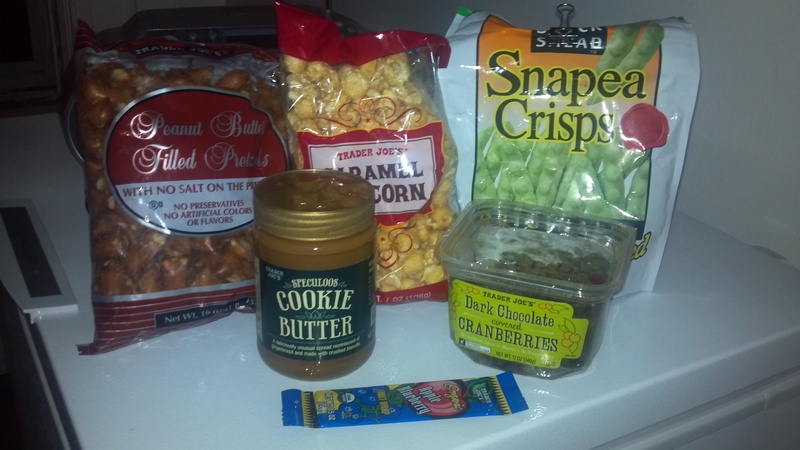 This was such a great package, I love that Kelsey sent me local products, allowing me to get a taste of California. Another huge thank you, Kelsey! This was such an awesome package! Two weekends ago, Farmer Ben and I went for our semi-regular Saturday morning coffee date, followed by the farmers’ market. I ordered my usual-unsweetened iced coffee with cream…Ben went for a froo-froo drink. Actually, allow me to clarify; I contemplated getting a kicked-up, flavored, slushy, coffee drink, but changed my mind, partially because I got the judging eyes from Ben. Then I ordered my iced coffee and he ordered the drink I had decided against. My jaw dropped and I let him know how shocked I was… and then, something amazing happened. Our barista gave me a brilliant idea. I had never thought of that! “I’ll allow it,” I replied. I’ve been thinking about chocolate whipped cream ever since. It’s the perfect combination, light and fluffy but with just enough give. Not too sweet, yet full of flavor. So simple…yet, just the right amount of … extra. I’ve felt a need to whip some up and last night was the perfect chance. The hubs and I both had the night off so I volunteered to make dinner. As the weather has been especially hot as of late, I opted for something simple. Lentil patties over a salad with yogurt sauce…and raspberry sorbet for dessert. 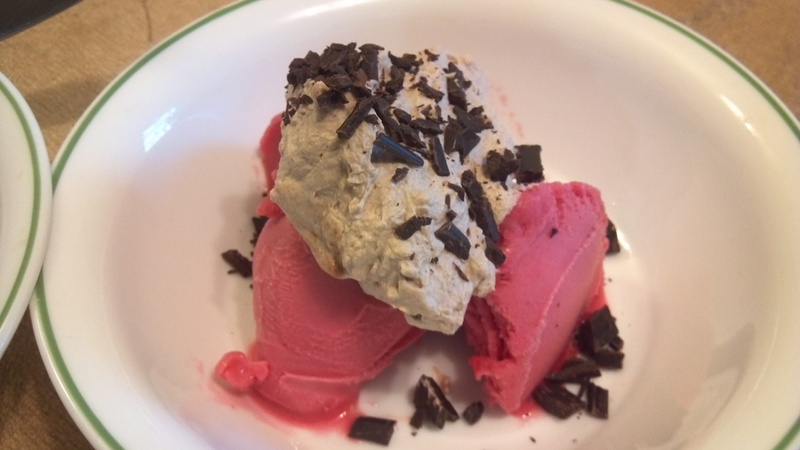 Don’t get me wrong, I love raspberry sorbet as is… but last night, I needed that something extra. So I made chocolate whipped cream. Then I chopped up a dark chocolate espresso bar that had been hanging out in our cupboard and sprinkled some over the top. Suddenly, a simple dessert was taken to the next level of delish. I apologize for the photo quality but I couldn’t stand it any longer-I had to wolf this down! And now, without further ado, here’s the recipe! Per my usual M.O., I didn’t really measure, so the best way to make this is to taste. Enjoy! 2-4 tbsp. Powdered Sugar- do this to taste… I prefer a creamy flavor rather than a super sweet, using less sugar. 1-2 tbsp. Cocoa Powder- again, to taste. I didn’t really measure but 1 or 2 tbsp. is a good amount. Pour heavy whipping cream into a bowl and beat using an electric mixer. When soft peaks begin to form, slowly add in powdered sugar and cocoa powder to taste, continue to beat. Add in splash of vanilla. Beat just until stiff peaks form. If not using right away, cover and refrigerate. Makes about 2 cups. Serve over ice cream, fruit, cake or with your favorite coffee. It’s a great life decision.